Strain GSLT (= DSM 2228 =ATCC 33744) is the type strain of the species Halanaerobium praevalens, which is the type species of its genus Halanaerobium . Originally described as Haloanaerobium , the name was later changed to Halanaerobium to conform with rule 61 of the Bacteriological Code . The genus currently consists of nine validly named species . The genus name is derived from the Latinized Greek word hals; halos meaning salt, the Latinized Greek word an- meaning not, the Latinized Greek word aer meaning air and the Latinized Greek word bios meaning life, yielding the Neo-Latin word 'Halanaerobium' meaning 'salt organism which grows in the absence of air' . The species epithet is derived from the Latin word 'praevalens' (very powerful, very strong, here prevalent) . Strain GSLT was isolated from the hypersaline surface sediments of Great Salt Lake, Utah, USA . Further strains of H. praevalens have been isolated from canned salted Swedish fermented herrings referred to as Surströmming  and probably also from the Red Sea . Other members of the genus have been isolated also from high salt environments distributed worldwide [7-10]. The enzymatic activities of the fatty acid synthetase complex and the D-BAPA (N’-benzoyl-arginine-p-nitroanilide)-ase of H. praevalens have been studied in more detail [11,12]. Here we present a summary classification and a set of features for H. praevalens strain GSLT, together with the description of the complete genome sequencing and annotation. A representative genomic 16S rRNA sequence of H. praevalens was compared using NCBI BLAST under default values (e.g., considering only the best 250 hits) with the most recent release of the Greengenes database  and the relative frequencies, weighted by BLAST scores, of taxa and keywords (reduced to their stem ) were determined. 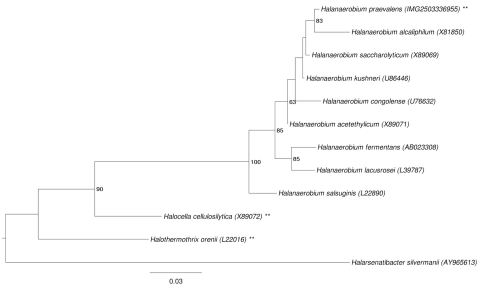 The five most frequent genera were Halanaerobium (81.9%), Halothermothrix (7.8%), Halanaerobacter (2.7%), Acetohalobium (2.3%) and Natroniella (1.9%). Regarding hits to sequences from other members of the genus, the average identity within HSPs (high-scoring segment pairs) was 97.8%, whereas the average coverage by HSPs was 96.3%. The species yielding the highest score was Halanaerobium saccharolyticum. 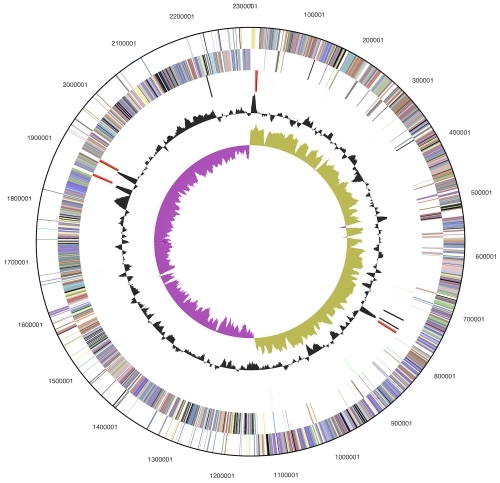 (Note that the Greengenes database uses the INSDC (= EMBL/NCBI/DDBJ) annotation, which is not an authoritative source for nomenclature or classification.) The five most frequent keywords within the labels of environmental samples which yielded hits were 'microbi' (9.4%), 'hypersalin' (9.1%), 'mat' (8.6%), 'len, miniprim, new, view, world' (8.5%) and 'food' (3.4%). The single most frequent keyword within the labels of environmental samples which yielded hits of a higher score than the highest scoring species was 'hypersalin, len, mat, microbi, miniprim, new, view, world' (12.5%). These key words are in line with the ecology and the niche from where strains of H. praevalens have been isolated. The cells of strain GSLT are straight and rod-shaped (1 × 2.4 µm) (Figure 2) when grown to the mid-log phase at 37ºC on CS medium containing 12.5% NaCl and 0.5% glucose . When grown at higher NaCl concentrations (> 20%) the cells appear granulated and shorter in length . 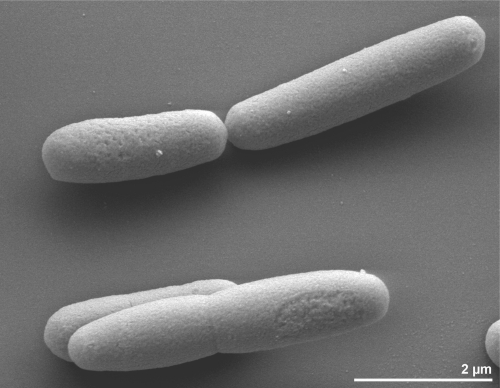 Single colonies were reported as white to translucent in color, 0.5-2.0 mm in diameter, and glistened, when grown on agar plates containing CS medium, 12.5% NaCl, and 0.5% glucose . H. praevalens cells stain Gram-negative  and electron microscopy in thin section revealed architectural features typical of Gram-negative bacteria . However, the positive D-BAPA-ase reaction  confirms its phylogenetic affiliation to the endospore-forming firmicutes (Table 1). In this respect, H. praevalens is able to hydrolyze only the D- but not the L- isomer of N’-benzoyl-arginine-p-nitroanilide (BAPA) . The activity of D-BAPA-ase was highest at low NaCl concentration (100 mM) and completely inhibited at NaCl concentration equal or higher than 1.0 M (~12%) . Strain GSLT is described to be non-motile, although many flagellar genes have been identified in the genome (see below). Other isolates of H. praevalens were described as motile [5,6], as were other members of the genus [7,9,10], suggesting strain GSLT is atypical with regard to motility. The organism is a strictly anaerobic chemoorganotroph . It grows at NaCl concentrations between 2% and 30%, with optimal growth at approximately 13% . The doubling time is 4 h at 12.5% NaCl and 7 h at 25% NaCl in complex CS medium . The temperature range for growth ranges from 5ºC to 60ºC, with an optimum at 37ºC . The pH range for growth is between 6.0 and 9.0, with an optimum at pH between 7.0 and 7.4 . Strain GSLT is able to utilize carbohydrates (including pectin and N-acetylglucosamine), amino acids, yeast extract, and trypticase; the two latter serving as carbon and energy sources on complex medium . The fermentation of glucose yielded butyrate, acetate, propionate, H2, and CO2 as major products . Also, fructose, D-mannose and maltose are utilized and methionine is transformed to methylmercaptan . Penicillin, tetracycline, cycloserine, chloramphenicol (each at 100 µg/ml culture) or sodium azide (500 µg/ml) completely inhibit the growth of H. praevalens . Strain GSLT was also able to degrade nitro-substituted aromatic compounds such as nitrobenzene, o-nitrophenol, m-nitrophenol, p-nitrophenol, 2,4-dinitrophenol, and 2,4-dinitroaniline . The fatty acid synthetase of H. praevalens is only slightly inhibited at 17.5% and was the first reported to be active in the presence of high salt concentrations . H. praevalens was reported to be involved in carbon sequestration in the Great Salt Lake , since it is present in the sediments of this lake in high numbers (≥ 108 cells/ml) [2,36]. H. praevalens regulates its internal osmotic pressure by the accumulation of salts (Na+, K+, Cl-) rather than by compatible solutes . High concentrations of these salts were measured inside the cells, in sufficient concentration to be isotonic or hypertonic with the medium . Thiosulfate reduction and rhodanese-like enzyme (thiosulfate:cyanide sulfur-transferase) activities also tested positive in strain GSLT . Early in 1987, Matheson et al. established the primary structure of the ribosomal A-protein of the strain GSLT, which is the equivalent to the ribosomal protein L12 from Escherichia coli. H. praevalens GSLT, DSM 2228, was grown anaerobically in DSMZ medium 210 (‘Haloanaerobium’ medium)  at 30-37°C. DNA was isolated from 0.5-1 g of cell paste using MasterPure Gram-positive DNA purification kit (Epicentre MGP04100) following the standard protocol as recommended by the manufacturer, with modification st/DL for cell lysis as described in Wu et al. . DNA is available through the DNA Bank Network . Oren A. 2006. Life at high salt concentrations. In: M Dworkin, S Falkow, E Rosenberg, KH Schleifer E Stackebrandt (eds), The Prokaryotes, 3. ed, vol. 2. Springer, New York, p. 263-282.